TiroGage represents one of the single best investments any HD vehicle operator can make. Mitigation of lost fuel efficiency due to poor tire inflation. Mitigation of labor costs associated with tire pressure checks. Low implementation costs. Installs in minutes. Requires almost no training for drivers. Pressure adjustments can be done while gage remains installed saving valuable labor expense. Very durable and rugged analogue design. No sensitive electronics or batteries. The confidence of 100 year old tried and tested technology. Properly inflated tires extend tread life and also maximize the casing lifeHelps prevent blowouts and associated costly roadside repairs, vehicle downtime, and delivery penalties. Provides an obvious tool to transportation inspection officials to help speed the inspections of vehicles and minimize inspection downtime. Pressure is continuously displayed at the wheel at all times, thus allowing an accurate pressure check during a standard vehicle walk around inspection (or DVIR). Poor inflation can increase the likelihood of skidding and hydroplaning in wet or slippery driving conditions. Properly inflated tires ensure the best handling and performance of your vehicle. TiroGage encourages the driver to visually inspect the wheel and hub assemblies of the vehicle where many unsafe conditions can be easily identified by a brief visual inspection. This improves the usefulness, incidence, and efficiency of driver vehicle inspections. Provides transportation inspectors an immediate, external visual indicator of your vehicle operational safety status. Tire debris constitutes one of the most prevalent and dangerous forms of roadside obstacles for drivers of all types. Widespread use of TPMS would decrease this danger for all drivers. The longer your tires last, the less tires are consumed, saving the resources needed for tire production. It takes approximately 22 gallons and 7 gallons of oil to produce a new and retread tire respectively. Tire fragments constitute a major constituent of roadside debris. Over 60% of all tire fragments found on the road are from medium and heavy duty vehicles. 90% of these tire failures have been found to be caused by tire under-inflation. Proper tire inflation decreases environmental emissions of all types, including tire scrap into landfills, carbon emissions due to decreased fuel economy, hazardous material release from accidents caused by poor tire inflation, among others. 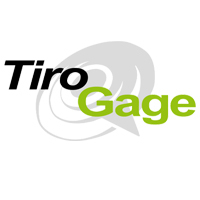 TiroGage contains NO environmentally dangerous materials, and is completely environmentally inert and recyclable. TiroGage makes the #1 obstacle to reducing both waste and emissions - improper tire inflation - convenient to rectify. 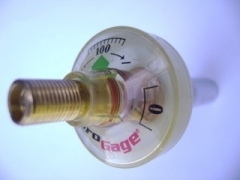 Pictured here, the easy-to-use device locks onto a tire's valve stem, displays exact pressure and never has to leave the wheel because it allows inflation through the gauge itself.